Because of their size advantage, Maryland was able to limit South Dakota State’s easy buckets in the pain. That combined with better than usual contests on the perimeter and cold jump shooting from the Summit League champions gave the Terps a 34-22 lead at halftime. SDSU was a miserable 9 of 34 (26.5 percent) from the field and even worse from beyond the arc at 4 of 17 (23.5 percent). Maryland took away the Jackrabbits best player, Mike Daum, by holding him to 7 points on an inefficient 3 of 8 shooting from the field with two turnovers. Maryland did not play with the same defensive intensity in the second half, which nearly cost them the game. It is called March Madness for a reason. South Dakota State trimmed an 18 point deficit to 2 in less than eight minutes of play. How they got there is simply embarrassing from a Maryland perspective. The Jackrabbits hit four 3-pointers, one old-fashioned three-point play, and knocked down six free throws when idiotically being fouled while attempting shots from long range. The first foul on a 3-point attempt by Maryland resulted in Melo Trimble‘s disqualification with five personal fouls. So not only did the Upper Marlboro native give away three points by playing poor defense but he also put his team’s playoff hopes in jeopardy with 63 seconds remaining. Maryland’s 18 point lead was cut to two with just over a minute to play, an eternity in the college basketball world. 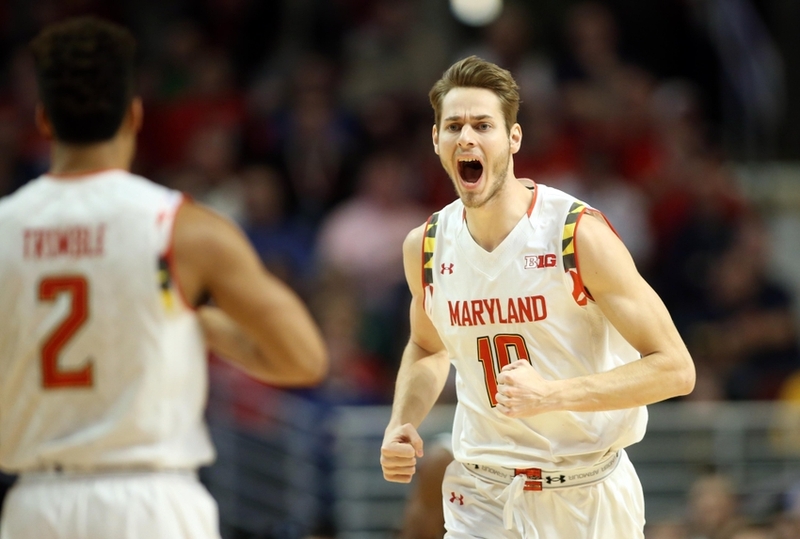 With the Terps best free throw shooter on the bench, Melo Trimble, it was up to four-year University of Maryland senior Jake Layman to answer the call. Not only did Layman knock down both free throws on one occasion, but he did it again 24 seconds later to put the Terrapins up five. Unfortunately after Rasheed Sulaimon also idiotically fouled a 3-point shooter and Jaylen Brantley only able to his 1 of 2 free throws, South Dakota State had an opportunity to tie the game with a 3-pointer to force overtime. This was the same exact scenario as last year against Valparaiso, except there was no chance to substitute out of a stop in action. The Jackrabbits head coach Scott Nagy regretted not calling a timeout after seeing reserve guard Brantley force Keaton Moffitt to pick up his dribble and a subsequent turnover before a shot ever went up, similarly to Varun Ram a year ago. All of Terp Nation should probably thank Mama Brantley for her son responding to adversity well. After that first free throw all I could think of was my mom yellin at the Tv mad at me lol couldn't disappoint momma had to make the second! 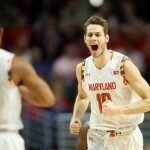 Jake Layman is one of Mark Turgeon’s favorite players because he “stuck with Maryland basketball” during a tumultuous summer 2014 that saw five transfers. Layman will be on his way to the NBA this summer, but wants to have “no regrets” to end his college career. Today went a long ways to ensuring that has the South Dakota State head coach Scott Nagy said Layman “won the game” for Maryland. Layman tied his career high in points with 27, was an efficient 7 of 11 from the field including a scorching 5 of 8 from beyond the arc, and made all eight of his attempts from the charity stripe. Now that the butterflies are out of the system and with the way Layman has been playing over the last month, Maryland has a good shot to advance to the Sweet 16 for the first time since 2003 (and maybe even beyond). The No. 13 seed Hawaii Rainbow Warriors upset the No. 4 California Golden Bears just before Maryland took the floor in Spokane. The Bears were without their leading scorer and point guard Tyrone Wallace and it showed with an assist to turnover ratio of 6 to 16. Hawaii operated extremely soundly in the half court set by shooting 27 of 52 (51.9 percent) from the field with only two points coming in transition. The likelihood of Maryland snapping their five-game losing streak in Round of 32 games definitely went up with Hawaii knocking of a Cal team with two potential NBA lottery picks that will both be selected before any Terps are drafted. Hawaii is certainly a much bigger team than SDSU with two 6-11 players including leading scorer Stefan Jankovic at 15.7 points per game. Jankovic leads the charge in making the Rainbow Warriors a top-6 team at scoring on 2-point field goals as the team takes care of business at a 55 percent clip inside. Hawaii is also a very good defensive team by holding teams to the 14th worst field goal percentage and while also forcing turnovers. The Rainbow Warriors are not very good from beyond the arc (32.7 percent) and at the charity stripe (68.1 percent). This means Maryland will not lose a big lead as quickly as they did today with 3-point shooting, while having a chance to make a comeback (if needed) by extending the game and forcing Hawaii to make their free throws.